“UFC on FOX: Evans vs. Davis” took place Saturday night inside United Center in Chicago, Illinois. FOX’s second foray into the mixed martial arts arena featured a light heavyweight scrap between Rashad Evans and Phil Davis. Evans handed “Mr.Wonderful” his first professional blemish with a landslide unanimous decision victory. Evans ran the table 5-0 on all three judges’ scorecards. “Suga” now challenges bitter rival and champion Jon Jones for his crown at UFC 145. Chael Sonnen posted a controversial unanimous decision win over Michael Bisping in the night’s co-main event. Uncle Chael advances to rematch champ Anderson Silva for his belt later this summer. * – The scores were initially read as a Split Decision (29-28, 28-29, 29-28) win for Weidman. Dana White said it was actually a Unanimous Decision victory for Weidman. UFC president Dana White didn’t attend the presser. Bisping felt he won the first two rounds. Most of what he read on Twitter backed his belief. Sonnen was relieved by decision. The third round was the only one he knew he won. Uncle Chael admitted telling Bisping that he may have lost the first two stanzas before the scorecards were read. Sonnen wouldn’t have been surprised if the decision would have went the other way. Sonnen will do his part to promote a figth with Anderson Silva, but he still isn’t convinced Silva will sign on. He didn’t take Bisping lightly after Mark Munoz withdrew. He trained just as hard, regardless of opponent. Lavar Johnson needed the KO bonus and felt blessed to get it. 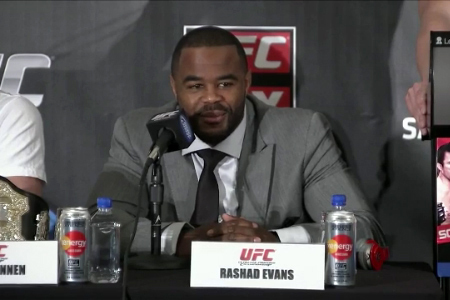 Davis doesn’t respect Evans’ wrestling more now that they fought, he has always respected it. Bisping is still confident that he will fight for the title one day and win it. Evans wasn’t thrilled with his performance, but was happy to get a win on such a big stage. He will be ready to fight Jones at UFC 145, he just needs to fine tune some things. Evans is not mesmerized by Jones like everyone else is. “Suga” admitted the nerves got to him a little earlier in the day. Sonnen has no idea what happened to his championship belt. Maybe someone stole it from him. He insists Anderson Silva has been faking injuries and doesn’t want to fight again.